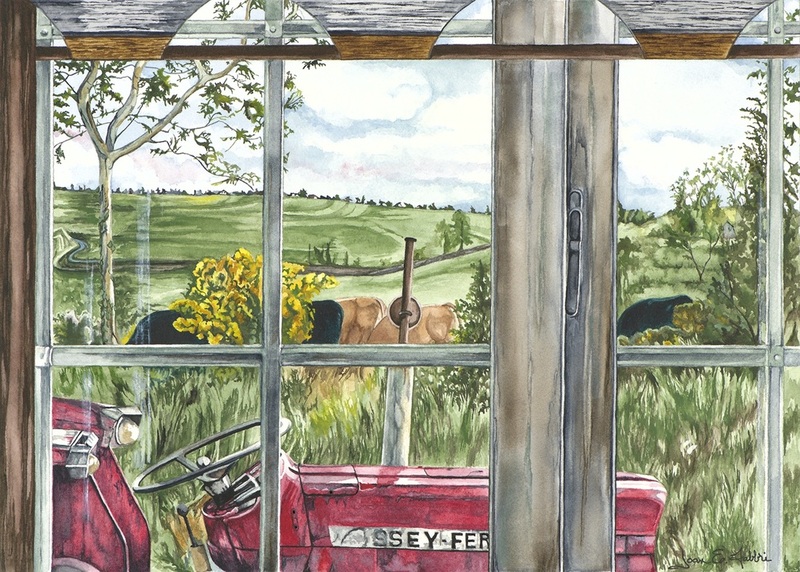 This painting is based on an original photograph taken by taken by me in Tallman NY. There is a Bible passage that says, “Ask and it will be given you. Seek and you will find. Knock and it will be opened to you. For everyone who asks receives. He who seeks finds. And to him who knocks it will be opened.” – Matthew 7:7-8. This comforting “passage” was the inspiration for the title “Passages”. 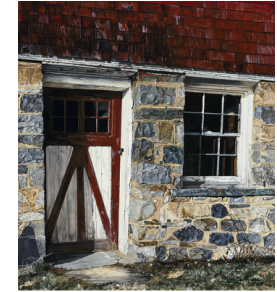 This single door surrounded by the wonderful texture of stone was the inspiration for this painting. I took the picture of this solitary door prior to the buildings restoration in Tallman, NY. Based on an original photograph taken by taken by me in Elizabethton, TN. Passages II was a follow up to Passages I and reminds me of Psalm 91:1-2, 11 . As a child I went to school in North Haledon, N.J. It was a private Christian school and as part of our learning experience we were required to memorize Bible passages weekly. Those passages have remained with me to this day and are near and dear to my heart. Unfortunately, my children never had the benefit of the “memorized passage” experience and as a result don’t know them as I do. The Passage series is an attempt to create a visual aid of Bible passages for my children to help them remember the verses. 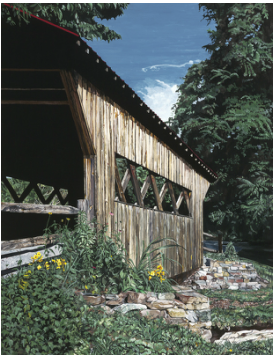 This painting received the 2014 Merit Award from the Delaware Watercolor Society and second place in the 2015 Delaware Technical Community College's 25th Annual statewide art exhibit. Located in Cape Henlopen is a walking path that travels through history to a place called “Fort Miles.” Tucked in the earth amidst the World War II relics are what looked to me, like vaults. Upon further investigation I found out from my neighbor Jeff (who was doing restoration at Fort Miles) that they were called “igloos.” One day on a fall walk my husband and I came across this particular igloo. 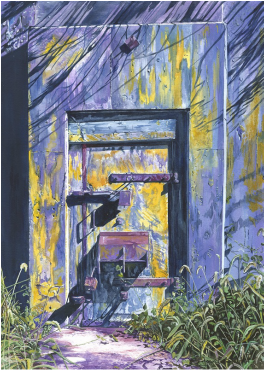 The shadows and colors were spectacular which is why I chose to paint it as part of my “Passages” series. Jeff told me that this igloo contained gun powder during World War ll. The Bible passage that comes to mind is Psalm 23: 4: Even though I walk through the valley of the shadow of death, I will fear no evil; for thou art with me; thy rod and thy staff they comfort me. This picture won first place at the 2015 77th Annual Rehoboth Art League members show. On a recent visit to Ireland, my daughter stayed with her girlfriend’s “Uncle Dan.” Looking out of his window one day she photographed this scene of the meadow below. I decided to add the painting to the “Passages” series because it gave me the feeling of Psalm 23: 1-2: The Lord is my shepherd; I shall not want. He maketh me to lie down in green pastures: he leadeth me beside still waters. I sure hope that Uncle Dan appreciates his view. As previously mentioned I’ve wanted to paint “passages” that I associate with a Bible passage in the hope that my children can visually associate the images with a Bible passage that someday they will learn. This picture was taken by my daughter Kimberly on a trip to Ireland. It is of a Dominican Friary that was started in 1252. 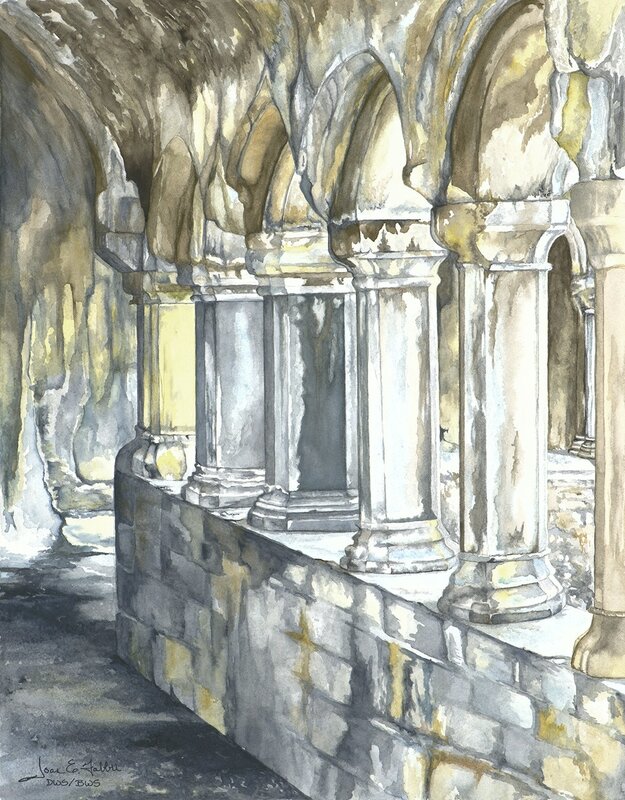 The whole setting lent itself to watercolor so it seemed the perfect next “passage” to paint. The Bible passage associated with this is: Psalm 62 vs. 1-2: For God alone my soul waits in silence; from him comes my salvation. He only is my rock and my salvation, my fortress; I shall not be greatly moved.